Recently, my angel friend, Stacy, challenged us all to make something that falls under the "Winter Art" catagory! Of course I have the perfect thing for this right now! 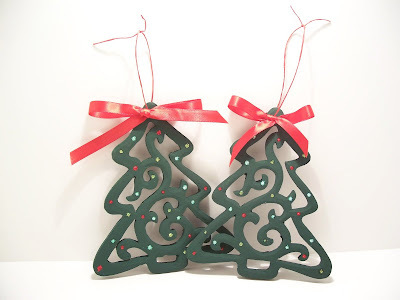 I recently made several ornaments for an Open House. 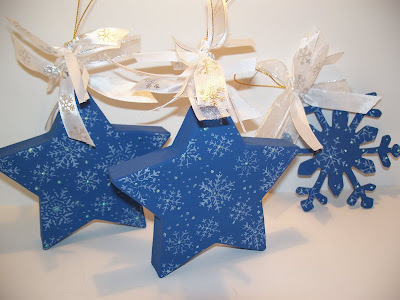 I used wooden snowflake ornaments from Hobby Lobby, painted them with acrylic paints and then stamped on them with either the TAC Snowflake set or the Christmas Cirlce set! 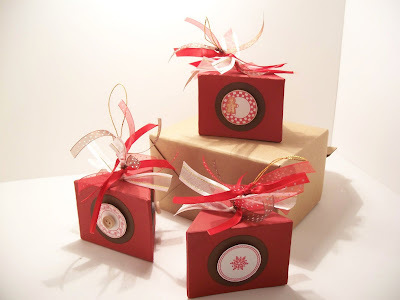 I also used lots of ribbon, as usual, and Stickles! Gotta love Stickles! 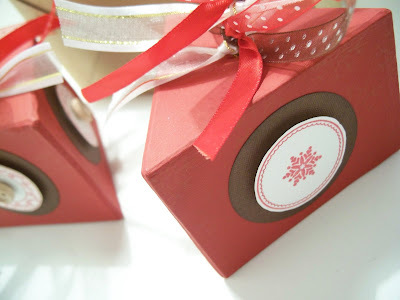 This one uses paper mache boxes from Hobby Lobby, painted red and then I used the TAC Christmas Circle set! 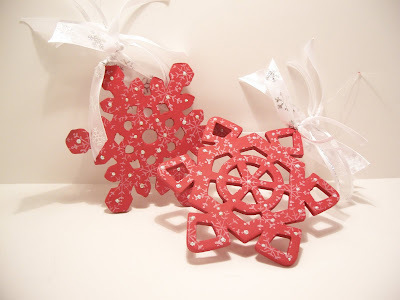 I also stamped the Snowflake set in the background but I don't think you can see it in the picture! These are just painted green with Stickles all over them! 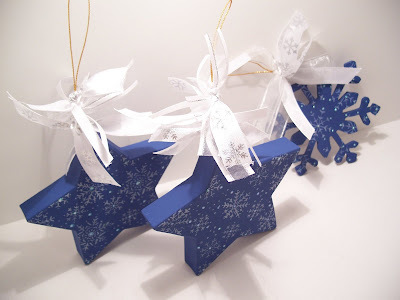 And again, wooden snowflakes from HL. 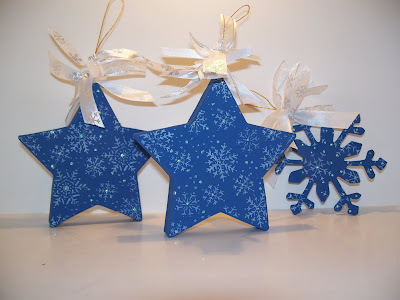 TAC Snowflake set with Stickles! All of the girls listed below have also created something in the Winter theme. Click on each of their names to see their blogs and what Winter Art they have created! This should help you get into the creating mood! Happy Winter! Stay warm!! You would think I would say it is with my husband. And I am....but that is not what I am blogging about today. I should say my kids....which I TOTALLY am....but again, not what I am blogging about. What then, you ask? 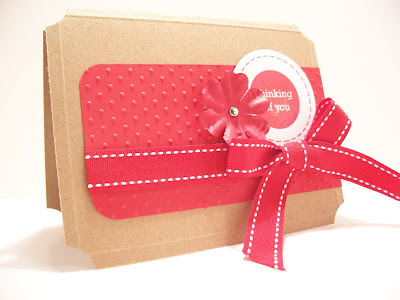 Well, I have re-realized my true love for the color red.....and Kraft cardstock! I know, that sounds corny but hey...at least I can admit it! I look back over my posts and you can really see it! Red and Kraft all over the place! So tonight I am posting some more Red and Kraft! I made these 2 different cards within a few days of each other not trying to make cards that look alike. It just happened! 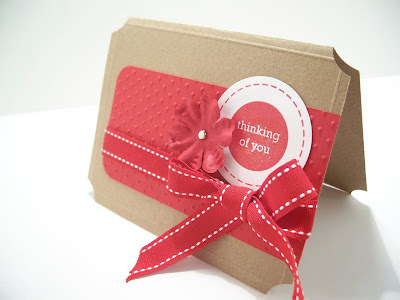 And really, there are NO other colors than Red and Kraft cardstock. Ok, I sound like a broken record now so I will just show you the cards. They are truly monochromatic! But I love it! And the pictures don't do them justice! The great thing about both cards is they are just way too simple but I think they turned out kinda cute! 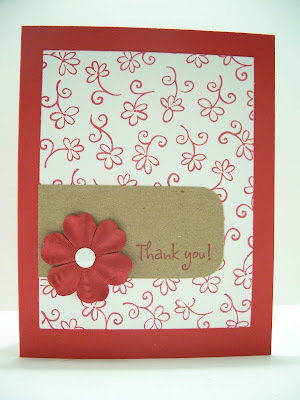 For this card I used Pure Poppy carstock from Papertrey, as well as Pure Poppy Palette Ink. 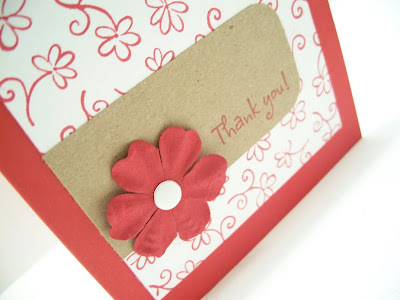 White CS from TAC along with the Ordinary Greetings stamp set for the sentiment and my fav, Kraft Cardstock from Hobby Lobby! The background stamp is Stampabilities from HL too! 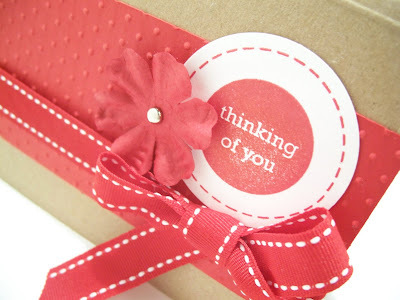 Oh the flower is from Hobby Lobby too, Paper Studio! Maybe the red is kinda boring to some of you but again, they are better IRL!! Hope you like them! Leave me some comments and tell me what you think! Thanks for looking!